Here we’ll focus on two modules that are often confused as to which do what functions. This refers to the single module in the center of the S/X dashboard, and includes the touch display, processors, RAM, non-volatile memory, the audio subsystem, 5 amplifiers, WiFi, Cellular, Bluetooth, GPS, the Ethernet bridge, multiple CAN bus communications, the LIN bus, USB ports and more. The MCU is responsible for the main display, all external communications, audio, cellular, navigation, and settings. It has little to do with Autopilot, other than selecting various settings. MCU1 – using a Nvidia quad-core processor was in all S/X cars made from the start of production to February 2018. MCU2 – using an Intel multi-core Atom processor, began shipping in the S/X in March 2018. MCU2 offers slightly snapper operation, WiFi was upgraded to support 5 GHz, the Bluetooth was upgraded with a newer version and additional antennas (external to the MCU2), along with other minor changes. The Model 3 architecture is different, with the display and MCU in separate modules. The Model 3 MCU also uses the Intel Atom processor and other components used in MCU2. There are currently four vehicle hardware variants related to Autopilot. HW1 – First Autopilot, based on the Mobileye chip. It used a single camera, radar and 12 medium range ultrasonic sensors. The electronics are co-located with the camera, behind the rearview mirror. HW2.0 – Tesla’s 2nd generation design, using 8 cameras, 12 long-range ultrasonic sensors and one front radar. An entirely new ECU processor module was crated by Tesla, based on Nvidia’s Drive PX2 system. This ECU is located below the glove box. HW2.5 – This provides a small update to HW2.0, primarily for redundancy and slightly improved reliability. This version also made possible two non-autopilot features – dashcam and sentry mode with local saved video. The first Model 3 Autopilot ECU hardware is similar to HW2.5 but uses liquid cooling from the cars coolant loop instead of fans. HW3.0 – A major update to the Autopilot ECU using Tesla’s own chip design. * Start of Model 3 production, but different hardware than S/X with same CPU as S/X. RAM 256 MB 5 GB 6 GB ? * In a camera each pixel is represented by 4 photocells, with a combination of filters: C=Clear, R=Red, G=Green, B=Blue. Multiple same filters for a pixel increases the light sensitivity. With RCCB, there is no green filter to improve nighttime light sensitivity, and green can be calculated to make a color image for the dashcam. Tesla has stated all owners who purchased Full-Self-Driving (FSD) option will get a free upgrade to the HW3 ECU processor, once software becomes available to take advantage of the new hardware. A tweet from Elon on 13-Apr-2019 states “Tesla will start FSD computer upgrade in a few months” for those that already purchased FSD. For owners of HW2.0 cars, the addition of HW3 ECU will provide the hardware necessary for FSD but is not expected to provide the two features HW2.5 vehicles enjoy – Dashcam and Sentry mode with local video storage. We suspect the HW3 retrofit could offer at least a monochrome dashcam on HW2.0 cars, but so far it appears Tesla is limiting the feature to cars equipped with cameras that can be made to show color video from the color cameras include in HW2.5 vehicles. HW2.0 may get a limited monochrome Sentry mode to also scare those that get close to the car. The sentry mode video is uploaded to Tesla’s servers. It is not yet clear how owners can access this video. 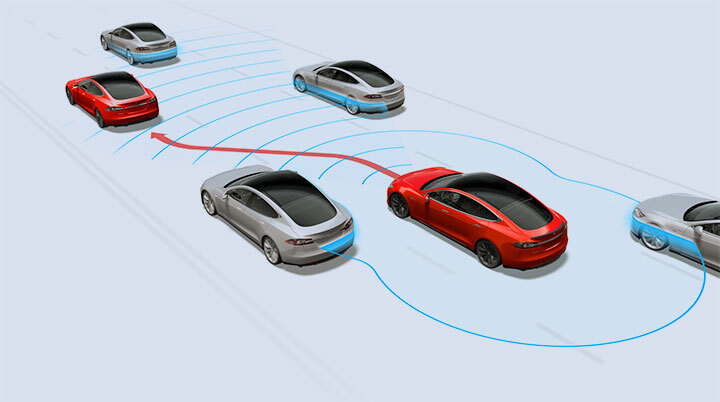 The Tesla Autopilot terminology has changed over the years. The first Autopilot system, using one camera, is now informally referred to as AP1. Starting with the new hardware HW2.0, Tesla changed the feature name to Enhanced Autopilot (EAP) with several extra features. In March-2019, Tesla dropped EAP and created a lower cost, less featured Autopilot that we call AP2. This new Autopilot is a subset of EAP features, with lost features being moved into the FSD (Full-Self-Driving) feature set. Autopilot features are optional, and can be purchased with a new car, or purchased and activated later. The following feature chart only applies to vehicles made on 17-Aug-2014 and later. Earlier cars do not have any of these features. For 99.99% of daily driving, FSD should work fine – just like humans. We suspect at some point FSD may even be tied into the weather network to determine if there will be an impediment to reaching the destination and advise of the issue. Some owners may be surprised to learn their car includes a 12v lead-acid battery. We’ll explain why and delve into everything about the 12v battery used in Tesla vehicles today. What is Different About How Tesla Uses the Battery? What Kills an AGM Battery? The first Tesla roadsters didn’t include a 12v battery but used a portion of the main lithium-ion pack to supply 12v for accessories and lights. This was not ideal, and in 2010 Tesla switched to a separate 12V battery in the Roadster 2.0. All Tesla vehicles since that time also include a separate 12v battery. The reason for a separate 12v battery is to power critical systems in the event of a high-voltage battery disconnect. This keeps key systems operational such as emergency blinkers, airbags, seatbelt pre-tensioners, brake booster and a host of other systems. The high-voltage battery might be disconnected due to several rare events – such as a high-impact crash, internal main battery pack problems such as some types of cell failures, a contactor failure and a few other unlikely situations. Heated items, if equipped such as seats, steering wheel, washer nozzle, side mirrors, rear defrost and camera heaters. Only a few items are directly powered by the high-voltage battery pack. This includes the traction motor(s), the a/c compressor, cabin air heater, battery coolant heater (S/X only) and the DC to DC converter for 12v power and charging the 12v battery. Tesla ran into a major snag with the introduction of the Model S in 2012. The 12v battery was sourced from an American firm, who unbeknownst to Tesla, outsourced the battery to China, and the Chinese company outsourced it to Vietnam! The quality was sub-standard and rarely lasted more than a year. Tesla switched vendors in 2013 and replaced all the marginal batteries in early build cars with a far more reliable battery under warranty. 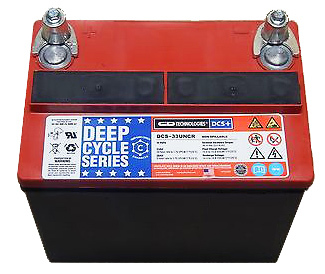 The Model S and X use a 33 Ah sealed AGM (Absorbed Glass Mat) deep cycle lead acid battery. One recent supplier is the C&D Technologies DCS-33IT. 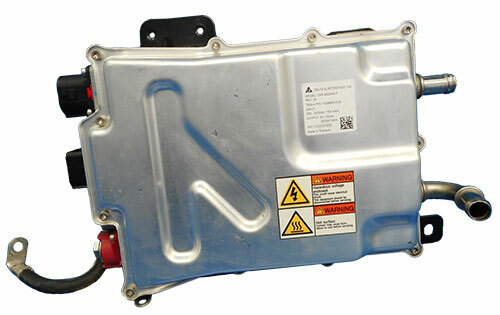 The Model 3 uses a 45 Ah, AGM Battery. One supplier is ATLASBX with the Model 85B24LS. AGM batteries provide more power for the size and weight than traditional lead-acid batteries. Deep cycle versions, like those used in Tesla vehicles are designed to be repetitively charged and discharged. If you were to use a typically lead acid battery in this application, it may only last a few months! AGM batteries are also sealed, which eliminates acid spilling accidents and the need to periodically add water. In new Tesla cars, the 12V battery lasts about 3-4 years for most owners, although paradoxically, if you put few miles on the car, it may last as little as 1-2 years. 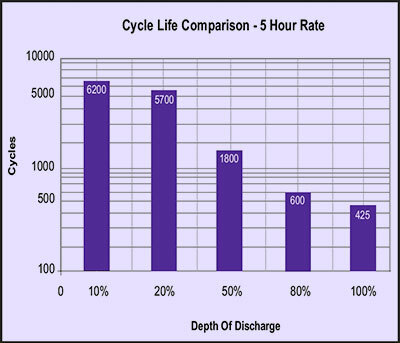 The difference is how many discharge/charge cycles the battery goes through and how deeply the battery is discharged. When driving, the DC-DC converter helps power the 12v system, and fewer charge cycles occur. A car left sitting, will need more charge cycles, and will age the 12v battery faster. Some Model S owners still have the original battery after 4 years and over 170,000 miles of use! The Model 3 is too new to evaluate its battery longevity, but Tesla made considerable changes to the electronics, which may increase battery life as well. 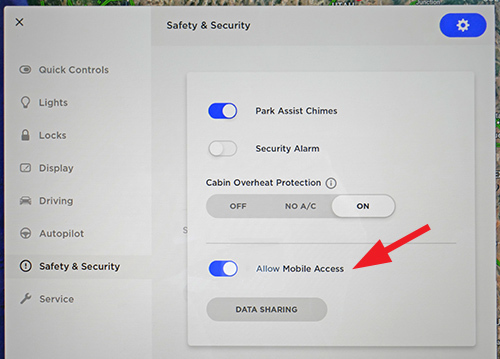 Your Tesla maintains power for some key computer systems all the time, so you can disarm the alarm, unlock the car with your FOB (or phone for the Model 3), and when you enter the car, everything starts up without any pause. In addition, the cellular connection for remote access needs power. All these systems require power even when the car is not in use. This is often called the car’s vampire drain. Tesla, via software, has significantly reduced the vampire drain of all cars over the years, but it can’t be eliminated. Newer cars also use modules that take a bit less power when the car is parked, so that helps. Even the oldest cars should easily get 2-3 years of 12v battery life, although there can be the rare exceptions. Just like ICE cars, sometimes the battery fails prematurely. Often an ICE car goes 3-5 years before replacement. The way the 12v battery is used in ICE cars is quite different than an EV. When the motor is running, normally the alternator powers all the 12v items in the car and charges the battery. The primary use of the 12v ICE battery is to start the car, which takes 2-3 seconds with very high currents. After starting the car, the battery is not really used. When the car is off, very little power is used, otherwise the battery would die in short order. A few BMW ICE models, and perhaps other makers, use a far larger battery and intermittently use the alternator. This reduces gas use with less alternator drag on the motor. The downside is the far more charge/discharge cycles means the battery is replaced about once a year, a $700 hit in the BMW! Tesla provides one option that may slightly improve the 12v battery longevity, if that is important to you. Turn off Mobile Access. This means you cannot access the car via your phone app. For most owners, the battery replacement cost a negligible part of the ownership costs. Having remote access is great feature, usually worth trading off for a slightly shorter 12v battery life. The 12v battery is always charged via a DC-DC converter from the main battery pack. This takes the packs high voltage and converts it to about 14v to charge the 12v battery. It’s a bit more complex, as the voltage to charge the AGM battery is tightly regulated and is compensated due to temperature. Even when you are charging the car, only the main pack is connected to external power. While quite rare, if the DC-DC converter fails, the 12v battery can no longer be charged. The Gen 2 DC-DC converter in the refreshed Model S accepts 220 to 430 VDC at 15 amps, and outputs 9 to 16 VDC. When outputting 12 VDC, it can deliver about 200 amps. The Model 3 integrates the charger and the DC-DC converter into a single package, the PCS (Power Conversion System). Tesla included additional hardware at the battery to help detect when the battery is nearing its end of life. Should the battery get within 3-4 weeks of the end, Tesla warns you with a clear message that the 12v battery needs replacement. This is dramatically better than most ICE cars, where the battery dies without much, if any, warning. Part of the reason ICE car batteries often die unexpectedly is the type of battery used. A standard lead acid battery will degrade over time, but the lead sheds during use and can short out plates at some point, causing the immediate cell death. An AGM battery, like the ones Tesla uses, should never fail this way. 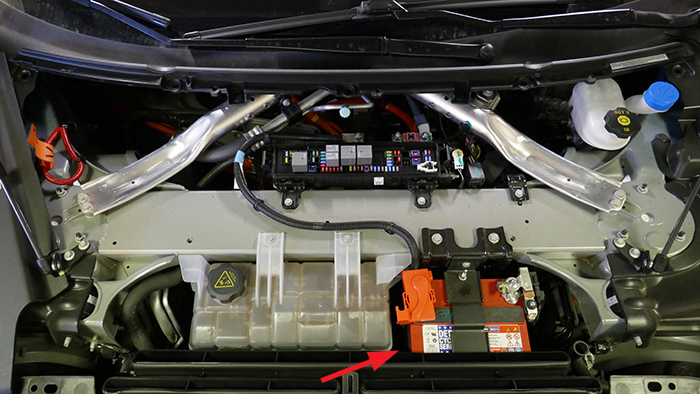 In all Tesla, the 12v battery is located under the hood. Over the years and models, it has moved around somewhat. The classic Model S RWD had the battery deep on the passenger side in front of the firewall. This location is tricky to get access too, but a trained Tesla tech can often replace this battery in less than 20 minutes. For someone not familiar with the process, it will take quite a bit longer. Starting with the AWD Model S, the battery was relocated to be easier to access and replace – on par with most ICE cars. The location remains about the same for the S, X and the Model 3. There are several easy to remove plastic panels to gain access to the battery. No tools are required to gain access. Over time the ability to charge and discharge effectively slows due to sulfation. Lead sulfate accumulates on the negative and positive parts within the battery during discharge. Over many charge/discharge cycles this process reduces the amount of energy that can be stored and extracted. At some point the battery is considered bad, even though it continues to work at some level. With proper instrumentation, such as done in the Tesla, a degraded battery can be detected well before the useful end of life. Fully discharging an AGM battery is bad, but not normally fatal. Fully discharging an AGM battery does reduce the batteries longevity. Normally this never occurs in a Tesla, but if vehicle is not connected to a charger, and the main battery is drained to 0% SOC (which has a hidden remaining charge), the 12v battery will stop being charged to protect the main battery. Within a few days, the 12v battery will be drained. One rare failure mode is an open between two cells. This is usually caused by improper manufacture of the battery or an external short. The battery voltage goes from normal to zero as soon as the open occurs, usually early in the life of the battery. Heat is also bad for an AGM battery, but the heat conditions encountered in a Tesla are fine. AGM batteries are not suitable in an ICE engine compartment that exceed the AGM’s maximum charging temperature of 140°F (60°C). There are 12v lithium-ion drop-in replacements for ICE car batteries. These are quite a bit more expensive but do weigh less – so you’d think they would be great in an EV. Not so fast. Turns out for Tesla’s application the frequent deep charge/discharge cycles would greatly shorten the life of a lithium-ion battery, perhaps only lasting 6 months to a year. Since there is no climate control on the 12v battery, it’s life would also be shortened if you encounter climate extremes. Lithium-ion 12v battery makes little economic sense in a Tesla. As I stated in the start, this project is a bit crazy for the cost and amount of effort it took. It really started with a phone based CAN bus analyzer I designed. This got bogged down as the off-the-shelf CAN bus products I tried couldn’t keep up with the massive amount of data Tesla produces on a single CAN bus, let alone the 4 busses I wanted to monitor. It works well when you limit the data (which is done at the hardware level), but I wanted it all. I shifted gears to designing my own low-level hardware and writing my own code for the microcontroller. This connected to the phone via USB. Bluetooth would never work for this, as it is way too slow. I then found the phone itself was also unable to process the massive amount of data coming in, store it and display the data in different ways in real-time. This was not going the way I wanted! During this time, a few other owners introduced products with limited CAN bus recording with off-line processing. I may revisit that project as the phones/tablets gain more power. I only need that Intel i9 18 core extreme CPU that lasts longer than a few seconds on a cell phone battery! I got the idea for Tshow when the refresh Model S came out, as it had the perfect display area behind the front T-badge. 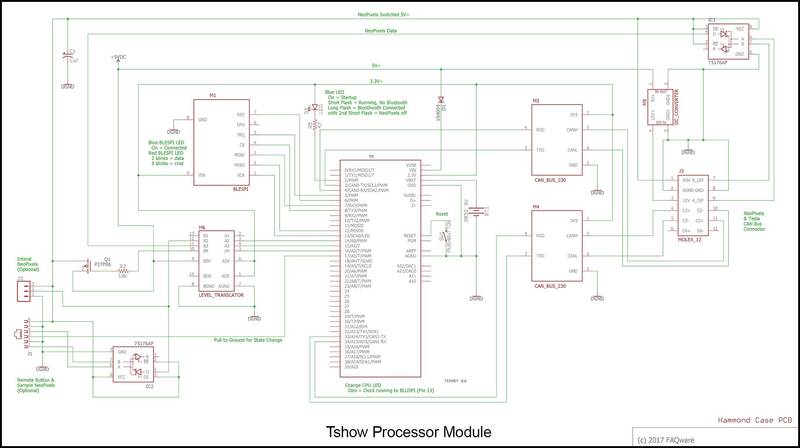 I could reuse some of the hardware and software work I’d previously done as Tshow is far less demanding. Meanwhile a new microcontroller with dual CAN bus hardware appeared late last year, which was perfect for this project. I didn’t need all four CAN buses, but I did need two (CAN 2 and CAN 3) for monitoring data. This CAN data was on a refreshed Model S. It’s likely to the be the same on all versions of the Model S and Model X. It may even be the same on the Model 3. To include day/night brightness and the holiday features, I needed accurate date and time. Unfortunately, I was only able to find date/time broadcast on CAN bus 6. Since I didn’t want to add a third CAN bus to the project, so I used the processor’s built in RTC along with battery backup. I wrote the code so the time and date is automatically set when the app connects to the processor. 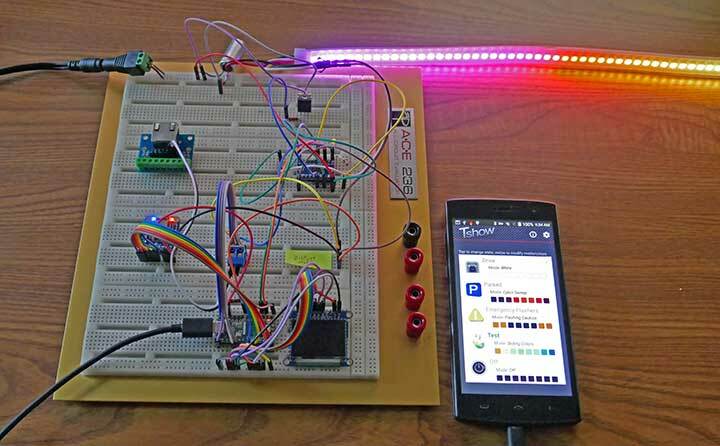 I built the prototype on a breadboard, which makes it easy to try out different processors and design ideas while creating the companion Android app. As the project rolled along, I concluded PCBs would be necessary to ensure the reliability and compactness. That meant learning the latest schematic and PCB software. Of course, I made a few mistakes, and had to re-run new boards. This is no different than most engineering projects (although costly for a one-off project). Version 2 still had a couple of minor errors, and the remote control’s NeoPixels data was unreliable on longer cables. I added a second differential bus transceiver and fixed the errors on the version 2 board. The version 3 schematic covers all these changes. A few sharp engineers may notice I used some modules rather than surface mount ICs. Surface mount parts are difficult to solder for a one-off project and these specific parts are only available in surface mount. Luckily, there are modules available with the surface mount ICs, that are only slightly more expensive than the IC itself. They do take up a little more PCB board space, but not enough to matter. The NeoPixels use a single serial data line. This becomes unstable for longer runs, typically over 12″. By using differential transceivers, the signal is not affected by wire length. The processor module connects to the receiver and remote via a differential connection, which in turn connects to NeoPixels. The receiver needs mounting on the T-badge assembly very close to the NeoPixel input. I found the desired mounting on the passenger’s side physically interfered with the radar module, so in a last minute decision, mounted it on the driver’s side and flipped the NeoPixels so the start (i.e. pixel 1) was on the driver’s side to keep the wire run as short as possible between the receiver and the NeoPixels data input. This required a fairly significant software change to “flip” the visual direction in various display modes. Along the way, I couldn’t find a suitable plastic box to house the remote unit. I got the brilliant idea to make a 3D box for it – having never done so before! This required learning a new CAD system – Tinkercad. It took 3 tries to get it right, but the design improved dramatically with each iteration. With that under my belt, I had planned to use a stock plastic box for the receiver, but a 3D box would be so much better. I got a good box design after two tries. For those who have never done 3D design, the tools today are quite impressive. Once the design is complete, I used an online service to choose a fabricator to make it, often in 2-3 days. Printing each box in ABS cost under $20. In the last iteration, I combined both boxes into a single print. 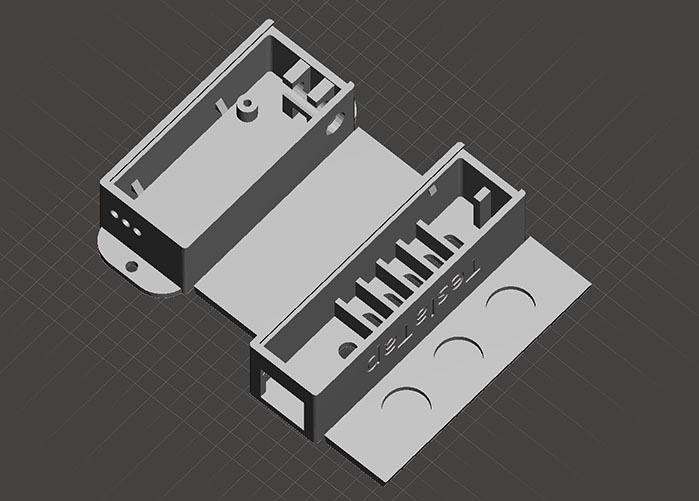 My one regret is not making a 3D box for the processor unit. This would have been a bit more complex design and costly. It would have saved quite a bit of rework on the stock plastic box. If this is ever made into a production product, a 3D processor box would be great. Check out our Tesla specific articles to help get even more enjoyment and understanding of your vehicle! Dates of articles are when the article was first published. We update these articles as new information becomes available. Here are some of the mostly undocumented technical aspects to the Model S, X and 3 that may appeal to the engineer in us! Since little of this is from Tesla, assume some data may be inaccurate. If you know more, we’d love to add to this list – just comment below and if possible, add a source. Tesla makes many ongoing improvements that can change vendors or specifications between older and newer cars, but we’ll try and keep this accurate. Acronyms – Use our Acronyms and Abbreviations to help in decoding terminology. Active Aerodynamics – Left and right front flaps boost aerodynamic efficiency and range by only providing additional airflow when needed through the radiators. Parts for the S/X are made by Rochling. These flaps are only open about 10% of the driving time according to Rochling. (from article in Auto Industries magazine Q1-2014, page 82). The Model 3 also includes its own shutter system, different from the S/X. Aluminum – The Model S skin and structure is 98% aluminum. The aluminum body only weighs 410 lbs (Dream Cars video Dec-2014). The Model X is similar. The Model 3 uses aluminum in the doors, hood and trunk. The Model 3 fenders are steel, as it much of the structure. Bluetooth – Near top of 17″ display (based on our signal strength measurements) in MCU1; With MCU2 (March 2018 and later cars), antennas in each side mirror housing. TPMS (Tire Pressure Monitor Service) – near bottom front of AC propulsion motor in 2012-2014 cars using 355 MHz. Late 2014 cars switched to 433 MHz and has displayable tire pressures. AutoPilot HW1.0 – The system is based in part with the Mobileye EyeQ3 hardware/software, a front facing camera, radar and 12 long-range ultrasonic sensors. (Computer Vision Video by Mobileye). Auto-pilot hardware was made available in all Tesla cars produced in September 2014 to mid October 2016. AutoPilot HW2.x – The hardware includes Nvidia’s DRIVE PX 2 AI computing platform, estimated to be 40 times more powerful than AP1. In addition the system includes 8 cameras, 12 longer range ultrasonic sensors (about 30 feet range), and a front radar. The hardware is included in all Tesla vehicles produced after October 19, 2016. Two levels of optional software are offered – Enhanced AutoPilot, as set of features that includes AP1 and more. A second Full Self-Driving (FSD) option provides Level 4 or 5 autonomous driving, once it completed and is approved by regulators (perhaps in 2019-2020). FSD requires a new processor called HW3.0. The Tesla AP2 processor board includes an Nvidia PG418 MXM module. This board contains a GP106 GPU and 4 GB of GDDR5 memory. The GPU has 1280 CUDA cores and in this configuration uses 128-bit wide memory. Interestingly, the PG418 board has pads for an additional 4 GB of memory for use with a 256-bit wide version of the GPU. 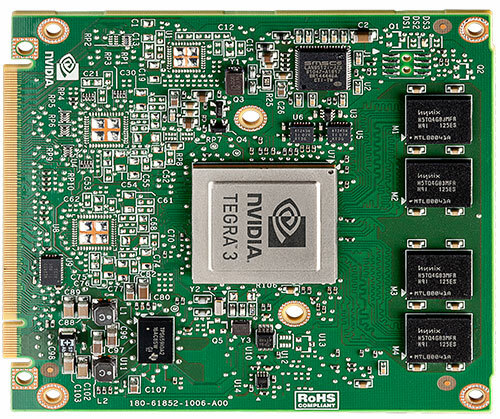 The main board includes many additional parts, including an Infineon TriCore 32-bit microprocessor; a blox NEO-M8L GPS/GLONASS/Galileo/Beidou module with sensors and dead-reckoning abilities; and a Nvidia TA795 Tegra SoC with Dual-Core CPU, Quad-Core Arm Cortex-A57 and integrated Pascal architecture. 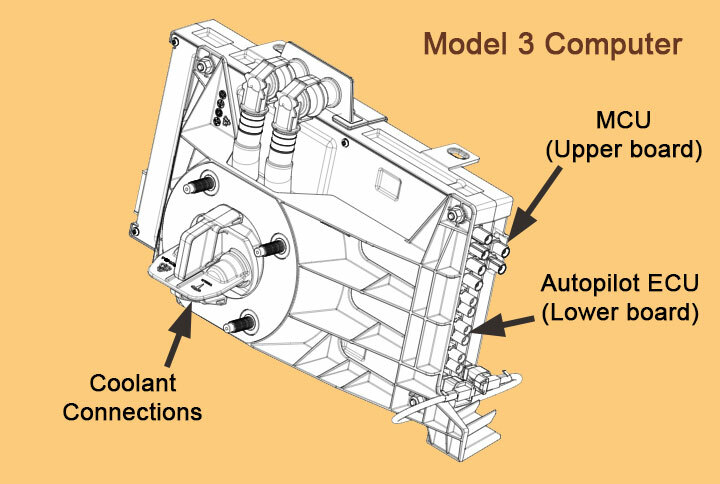 On the Model S and X, the unit is air cooled with fans. On the Model 3, it is liquid cooled using the car’s cooling system. 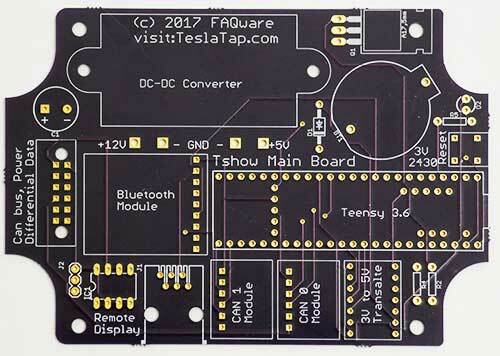 AutoPilot HW3.x – Tesla announced in late 2018 that a new HW3 AP processor module would be required for FSD. This module includes a Tesla created processor that offers far greater performance than the HW2 platform. It is expected all S/X/3 vehicles made in mid 2019 will include this new processor. Those owners that have HW2 and paid for FSD will get the HW3 upgrade for free. AP – This is a new variant introduced 28-Feb-19 that includes Traffic Aware Cruise Control (TACC), Autosteer and Auto lane change with confirmation. It is a $3,000 option. EAP – Now, discontinued, it offered on HW2.x vehicles, AP features above, Navigate on Autopilot on highway, Autopark, and Summon. It will include a new feature advanced Summon when available. When offered, EAP was a $5,000 option. FSD (Full Self Driving) – For HW3.x vehicles, it adds to AP and EAP features: Navigate on Autopilot in city, traffic light and stop sign detection, auto-lane change without confirmation. These features are not released yet. The total cost of AP+FSD is $8,000. Customers with prior FSD purchase will get the HW3.x upgrade for no cost. Customers who ordered EAP prior to 28-Feb-19, but where the vehicle had not been delivered at that date, will get FSD instead of EAP at no additional cost. Prior EAP owners can get FSD for $3,000, which includes the HW3.0 upgrade. Common color cameras use four filters – RGGB (red, green, green, blue) over cells to create a single color pixel (two green are used to increase the resolution/luminance. Most Tesla cameras uses clear on 3 cells for monochrome, and a red filter on the fourth cell (RCCC). This increases the monochrome light sensitivity, as color is not important, except for the ability to detect red traffic lights and taillights. All but the rear camera is the same Aptina AR0132 camera (Aptina is now On Semiconductor). It is a 1/3 inch CMOS 1.2M device, capable of 720p at 60 fps. Tesla appears to be using a visual field of 1280 x 960 at 30 fps. An addition 4 vertical rows of camera (not visual) data make each frame 1280 x 964. The rear camera uses the OmniVision OV10635 720p CMOS sensor Tesla is using 1160 x 720 at 30 fps. SMK from Japan appears to be the company assembling the module. At the introduction of AP2, the rear camera module changed and has a built in heating element. The module is connected via four wires – power and LVDS data lines. The cameras used by the DashCam feature and Sentry mode are in full color. This includes the narrow front camera and the left and right side pilar cameras. Thanks go to verygreen, lunitks and others for some of this information. 85/90 kWh – 400V, 7104 total cells in 16 modules, each with 6 groups of 74 cells = 444 cells, producing 25 volts (our analysis from battery photos); nominal voltage 346 VDC. 90 kW uses higher-capacity cells. The 85 pack weighs about 1330 lbs. 75/70/60 (v2) kWh – 350V 5880 total cells in 14 modules, each with 70 cells = 420 cells, producing 25 volts (our analysis and conjecture); nominal voltage 302 VDC. 75 kW version uses higher-capacity cells. 70 kW cars starting around May-2016 are using the 75 kW pack, but are software limited to 70 kW. These packs can be upgraded over-the-air to 75 kW for a fee. Similarly, the 60 kW version 2 (June 2016 and after) use a 75 kW pack and is software limited to 60 kW and can be upgraded to 75 kW for a fee. Classic 60 kWh (2015 and older) – 350V, 5040 cells in 14 modules, each with 6 groups of 60 cells = 360 cells, producing 25 volts (our conjecture); nominal voltage 302 VDC. The 60 pack weighs 1150 lbs. Individual cells are 4.167 volts at 100% SOC or nominal 3.6 V (based on our reverse calculations of pack cells and capacity)* The classic cell current is 3100 mA, and newer cells used in the 90/75 pack current are about 3280 mA. Cells are in a 18650 form-factor casing sourced primarily from Panasonic (the exact battery is only sold to Tesla and is not otherwise available) . LR – 80.5 kWh – 4416 total 2170 type cells in 4 modules; 2 modules with 23 groups of 46 cells each, and 2 modules with 25 groups of 46 cells each (from electreck). Based on the Tesla EPA report, the long range battery pack is a nominal 350 volts. The max is 400 volts, and minimum of about 242 volts with a peak discharge rate of up to 1200 amps. The pack weight is 1054 lbs. SR – 50 kWh – 2976 total 2170 type cells in 4 modules; 2 modules with 23 groups of 31 cells each, and 2 modules with 25 groups of 31 cells each (from electreck). Battery active conditioning – Cooling when at 48°C or above, and heating when -7.5°C or below (from Ingineerix). 12 V, 33 Ah sealed absorbed glass mat deep cycle lead-acid. It is used for most everything other than propulsion and HVAC. One vendor Tesla uses is C&D Technologies DCS-33IT battery prior to the refresh in RWD models. The refresh S uses a C&D Technologies DCS-33UNCR. The 12v battery condition is monitored with a Hella Intelligent Battery Sensor. See more at our 12 Volt Battery Compendium. 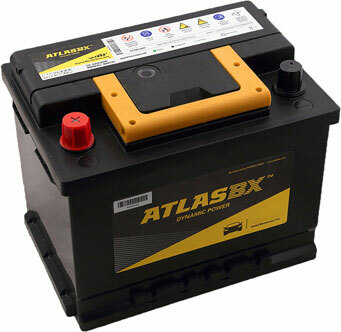 12 V, 45 Ah, Atlasbx, 85B24LS – An advanced lead-acid battery. See more at our 12 Volt Battery Compendium. Bluetooth – 3.0 + HS; Audio streaming with A2DP sink, A2DP source, AVRCP 1.4; Audio Profile A2DP includes support for standard SBC codec (highly compressed low-bit rate audio); Uses the Parrot FC6050 W chip. CAN 2, 3, 4 and 6 are accessible from the diagnostics connector. The OBD2 port has access to CAN 1 and 6. Ethernet is accessible from the ethernet diagnostics port, but only by service. With current software it is normally disabled. A single connection between ODB-II and MCU. Connectivity – GSM 3G/4G LTE with HSPA+ depending on vehicle production date. In the USA, Tesla uses the AT&T’s cellular network. Every Model S supports 3G. The hardware does not support LTE in early cars. New LTE capable hardware/software is included in all cars manufactured after May 2015. Early cars use the Sierra Wireless AR8550 (TMC Forum). We suspect new cars have switched to the Sierra Wireless AR755X module (unconfirmed). Contactors – These connect the high voltage battery pack to the car. See our detailed contactors explanation and analysis. GPS – U-Blox (from a Model S diagnostic screen, installed equipment); AP2 cars also include a high precision Blox GPS module. See AutoPilot above for more details. Fob antennas each have a range of about 3 feet. 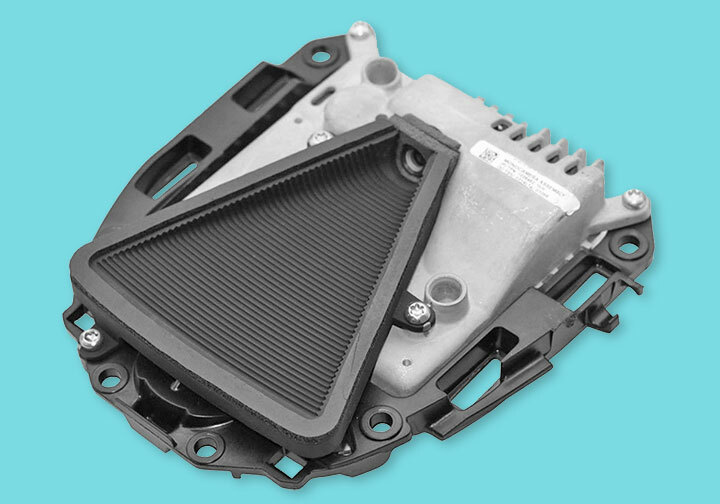 If battery is dead, it can be powered via RF energy from antennas – best placement is in the cup holders, or on the center windshield if outside). New FOB design with improved cryptography with new cars starting June 2018. Lights – Our lighting count has over 430 LEDs (Light Emitting Diodes). Motors – Our motor and solenoid count for the S/X comes up with over 60 when all options are included. Motor weight about 150 lbs. Motor assembly (with reduction gear and inverter) weight 300+ lbs. 100D/X100D – Unknown, but more than 90D/X90D. P100DL/PX100DL – Unknown, but more than P90DL/PX90DL. Liquid cooled, with temperature monitored stator* Model X horsepower values are no longer stated on the Tesla website after 2015, and assumed to be unchanged from prior values. Battery limited values are maximum motor shaft power. 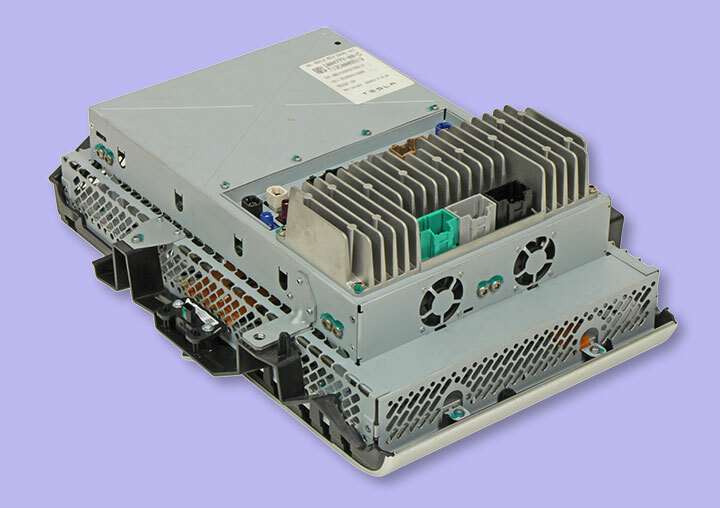 Motor Inverter – This converts the DC battery voltage to AC, powering the motor. On the S/X, it delivers up to 1000 amps (from Tesla 2010 10K annual report). On the P85D/P90D it delivers 1300 amps. With the Ludicrous option, it is boosted to 1500 amps (from Tesla blog). Music Formats – While only MP3, MP4 and AAC (without DRM) are documented, it also supports AIFF, OGG, WAV and FLAC (16 and 24 bits up to 176 kHz or more) files. Version 7 and older had undocumented support for WMA and lossless WMA via USB, but a bug causes dropouts in WMA files. WMA has since been dropped in Version 8. AIFF format supports 16-bit, but not the less common 24-bit format. See ‘USB’ below for flash drive formats. The best audio quality occurs when using a lossless format such as AIFF and FLAC via the USB connection. See more at USB Flash Drives for Music. Navigation System – A Tesla combination of Google on the main display and Navigon (a Garmin company) for the Instrument display and guidance. OEM Suppliers – There are over 300 OEM suppliers providing over 2,000 parts for the Model S (from 2013 Annual report). This Model S Suppliers Business Chart shows many of the major OEM parts supplied to Tesla in 2012. While many of the suppliers are the same as the Model S, this 2016 Suppliers for the Model X chart shows the latest OEMs (although the image is the prototype X). Operating System – Tesla created code running on Linux, written in C (PC World interview); Modified Ubuntu using the ext3 file system (dragtimes). Early in the development Tesla considered both Android and iOS, but the key people at Android recommended against it, and Apple was unwilling to even talk to Tesla (Elon, video @36:10). Vehicles- before version 8.1 (17.24.30) used the Linux kernel 2.6.36 for the center display. With the Tesla version 17.24.30, the kernel was updated to Linux 4.4.35. (Electrek). Functionally, there doesn’t appear to be any difference and no new features were added related to the OS upgrade. Paint Color Codes – Tesla uses standard paint color codes. Some colors have multiple names or have changed names. You can also confirm the color on label when you open the driver door. Look for the white label is near the bottom door jam. The paint code appears on the bottom line of the label after PNT. Check our in depth article on Paint and coatings. Patents – Tesla Motors has hundreds of patents issued and hundreds more pending (from 2013 Annual report). Lots of interesting reading! Here’s an alternative list of Tesla patents that seems more current. Power Connector – Below the center arm-rests, the 12 v “cigarette lighter” power connector is fused for 15 amps. It is a switched circuit and power is removed when the car turns off. When the car is on, and the car is charging the 12v battery from the main battery, this connector’s voltage measures at 14.4 volts (from our measurements and analysis). The Model X includes a second 12v power connector in the trunk area. Processors – Our CPU report has over 60 processors on a fully loaded Model S.
Radar Transponder – Tesla uses a 77 GHz radar transceiver (from article by Ron Freund in Jan-2015 Current EVents). The first radars likely used the NXP’s MR2001 chipset or similar and the chip consumes a negligible 2.5W when operating. The Radar system is present in all cars built after late-September 2014 and until Fall-2017 were sourced from Bosch. 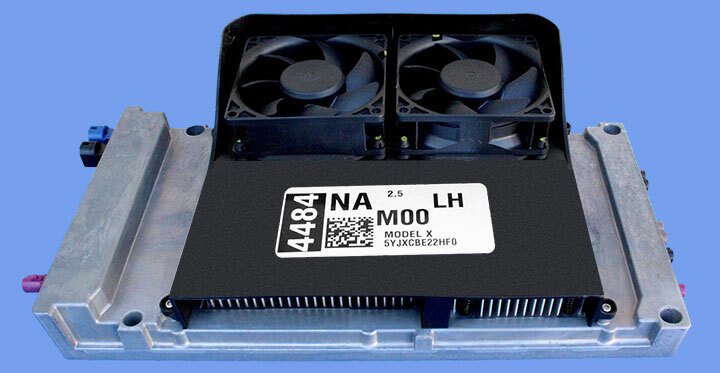 Vehicles with AP2.5 hardware, including all Model 3 cars, now use a radar assembly from Continental, the ARS410 CV, similar to the ARS404-21 or ARS408-21. It consumes under 7W typical, with a peak of 12W. Sounds and Noises – Our analysis of Normal and abnormal sounds from your vehicle along with solutions. Diagnostic Access – Press Tesla logo at top of the main display for 2 seconds, then requires password. The password is changed frequently (daily?) and may be specific to each car. Screen Snapshot – Press lower-right steering button labeled “Back” for 2 seconds. Used to save both screens to a file. Only Tesla has access to the file. Ethernet connector – via custom 4-pin connector behind driver side dash panel (only enabled via Tesla service through WiFi or 3G/LTE). A fleetwide software update in August 2015 added additional security to prevent non-Tesla access through this connection. Bug reports – If you have what appears to be a software bug, press the Voice Button and say “Bug Report” along with a short description of the issue. Both screens will automatically be captured with the log, along with the message. This is all forwarded to Tesla. Superchargers – In North America, each pair of stations is feed from one Supercharger package that uses 3-phase 480 V at 200 amps. Within the Supercharger package are twelve 10 kW inverters for a total of 120 kW. Newer Superchargers have 135 kW, and the newest Superchargers may go to 145 kW. 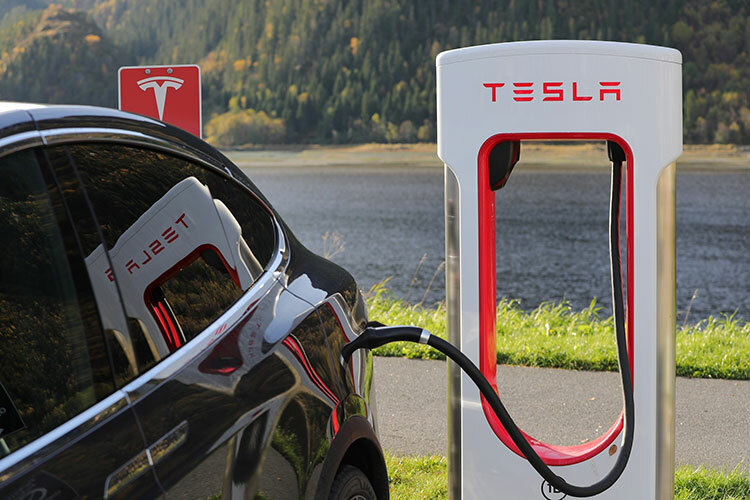 While not confirmed by Tesla, it was stated in a European ASA ruling where Tesla provided information that a 145 kW Supercharger exists (article was removed from the ASA site in March-2017). The new 72 kW stalls connect to a 145 kW Supercharger now). Each of these inverters can be directed to one of the two stations, so that the power can be split between the two stations in increments of 10 to 11.25 kW increments. There is no power in the charging cable until the car properly handshakes with the Supercharger, so it is safe to use in the rain. The charging for 85/90/100 kW 400v models is currently set to a maximum of 120 kW. Very early 85 kW cars (2012 and early 2013) are limited to 90 kW with the A version battery. All 40/60/70/75 kW 350v cars are limited to 105 kW due to the lower pack voltage. More details in our Supercharger SuperGuide. Suspension – While components such as the Bilstein monotube shocks and Brembo brakes are well known, check out this excellent analysis by Edmunds of the entire suspension system with extensive photos and explanations. USB Connections – Two front ports on all Model S/X/3 provide USB 2.0 (compatible with USB 3.0 running as 2.0) for connecting to USB drives and charging devices. The refreshed Model S and Model X has two additional rear ports for the 2nd row and the Model X in the 6 and 7 seat configurations as one more port in the last row. These additional ports only supply power for charging devices. USB 2.0 ports can source up to 500 mA, although our tests showed we could get about 600 mA from the charge-only ports. Devices that can be connected in the front ports include flash drives, hard disks (with USB connection), phones, mice and USB diskette drives and some music players. USB keyboards were disabled in software version 4.5 and later. To access music via USB, the drive must be formatted for FAT32 or Linux Ext4 format. As of a test in Jan-2017, using 8.0, exFAT is not supported, nor is NTFS. See more on how to select and use an USB Flash Drive for Music. Some USB connected Android phones and tablets may provide drive-like memory access that the vehicles can see. This seems to be a bit hit and miss depending on the device’s design. Apple’s iPhone and iPod’s proprietary data format is not seen by the vehicle. VIN Decoding – Try out our VIN (Vehicle Identification Number) decoder, supporting all Roadsters, Model S and Model X vehicles at Vin Decoder. WiFi – b/g/i/j/n 2.4 GHz hardware support, but we believe only b/g are currently enabled in software; Uses the Parrot FC6050 W chip. Use WPA or WPA2 for the best security. Low security WEP was supported in early software versions, but now smartly, is no longer supported. With the Model 3 and S/X MCU2 in March-2018, 5 GHz is supported.